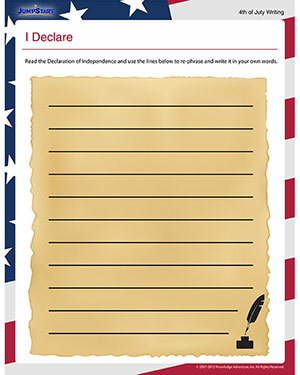 ‘I Declare’ is an Independence Day themed writing worksheet that helps fourth graders hone their writing skills. What’s more, this fun and free worksheet also doubles up as a history printable as it encourages kids in 4th grade to read our country’s Declaration of Independence! Help your 4th graders exercise their grey cells as they get busy thinking comprehending and composing the declaration in their own words. This worksheet is fun way of getting the kids involved in their national history as well as improving their writing skills in one shot! Also check out our range of other fun 4th of July worksheets.